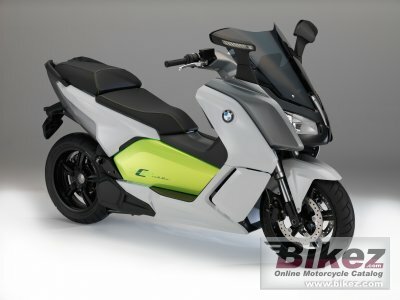 2014 BMW C Evolution. Picture credits - BMW. Submit more pictures. Dynamic and athletic, clean and quiet: the BMW C evolution is the intelligent answer to increasingly heavy traffic, rising energy costs and positive environmental awareness. But the fact that the maxi scooter runs 100 per cent on electrical power is not just good for the environment. With a peak output of 35 kW (48 bhp) at a powerful torque of 72 Nm it provides genuine riding pleasure with a full charge for up to 100 kilometres. Comments: 8 kWh lithium-ion battery. Range 62 miles. Windscreen. Ask questions Join the 14 BMW C Evolution discussion group or the general BMW discussion group.